Saint Anything was the final book on my list to read for my Sarah Dessen Readathon! I originally read Saint Anything back when the book first came out back in 2015, and I remember really enjoying the story when I read it. Yet, I feel like I enjoyed it even more the second time around, and that, my friends, is the best feeling ever! I know I've probably said this in ALL of my reviews, but Sarah writes such awesome main characters. I'm always able to relate to them in some way or another, and that goes for the main character in this book as well. I knew exactly how Sydney felt as the story went along, and I actually related to her in more ways than one. Thank goodness she had really awesome friends, and even parents, though I wanted to scream at them more than a few times throughout the story. I love so many characters in this book. They are great friendships, and great romances, and so much more. Now that I've read ALL of Sarah's books, I can look back and see how the books are connected, yet different in their own ways. I LOVE THIS. I love the settings and the storylines, and even the little cookies that she leaves for us throughout the books. I'm so glad that I decided to read all of these books over the past few weeks, not only because contemporaries are my favorite, but also because they all made an impact on me, all in different ways. I definitely see a reread of all of these books in the future. 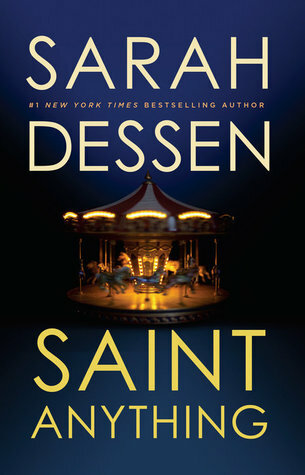 Overall; Saint Anything was a great ending to my Sarah Dessen Readathon. While I'm thrilled that I can finally say that I've read ALL of Sarah's books, after having wanted to do so for so long, I am also so sad to be done with all the books! I still have Once and for All to read, but I'm saving it for a few more weeks, but I can't wait to dive into it as well. If you've made it this far with me, congrats to you! And if you're curious at all about Sarah's books, I implore you to definitely check them out. They are all SO worth the read. I have this one sitting on a stack in my bedroom. :) I've heard, like, nothing bad about this book, so I'm very excited to read it! I did read one of her books, What Happened to Goodbye I think, and it was okay. Hoping that some of her other, more pronounced titles will leave more of an impression on me. Thanks for the honest review!